I’m operating the Icom 7300 RTTY FSK. Wow, I have wanted to try RTTY (FSK) for years. This is the first radio I could get it setup on without having to buy external equipment. I’ve used AFSK in the past and it’s fine, but there’s always the adjustment of the soundcard involved and if it gets knocked around the signal is lousy. I feel like I have to continuously monitor it. I have FSK setup now using MMTTY which of course is used by N1MM Logger. N1MM is my favorite logging program for contests. I’m not a serious contester, more of a casual contester. Can’t wait to try it in a contest. Why FSK? 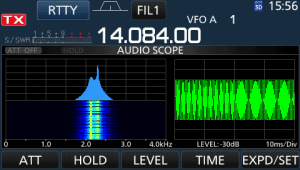 Well there’s the sound card issue with AFSK and I noticed after setting up AFSK on the 7300 that the signal on the spectrum scope is not aligned with the signal on MMTTY (N1MM Logger). In other words when I use the 7300’s spectrum scope to tune to a signal and line it up, it’s not in the band scope of MMTTY. It’s completely outside the band scope and I have to go searching for it. Using FSK, when I tune to a signal using the Icom 7300 spectrum scope, it aligns perfectly in MMTTY’s band scope. There are other advantages with FSK, but I won’t go into a lot of detail. AA5AU explains it pretty well. The article is here. I want to show how it’s setup. In the radio there are a few settings to be made. Go to Menu>Set>Connectors. I changed DATA MOD to USB because I’ve been operating PSK31 with the sound card. USB SEND is set to RTS. USB Keying (CW) is set to DTR and USB Keying (RTTY) is set to DTR. This works for me, so try it this way. I’ll post a video clip in a week or so bringing this all together, ie., PSK31, CW and RTTY (FSK). The key here is the plugin. If you don’t already have MMTTY installed go ahead and do that. Download it here. Then get the plugin here. (UPDATE 7/10/17: The EXTFSK v2.0e looks to be included with MMTTY, so there’s no need for the extra download. Try MMTTY first, and if you don’t see EXTFSK when setting up MMTTY, you can download EXTFSK from here) If needed, install the plugin following the directions on the page. Open MMTTY go to Options>Setup MMTTY. Go to the TX tab. The Port for PTT & FSK should be set to EXTFSK64. That will bring up the plugin window. Select your COM Port for the USB cable. FSK output = DTR, and PTT output I have set to RTS. Next go to the Misc tab. Under Tx Port select COM-TxD(FSK). Click the USB Port button and select A:Normal. The next tab you go to is the Soundcard tab. Under Reception select the USB Audio CODEC for the Icom 7300. (This is installed before you connect the USB cable and it’s the driver you downloaded from Icom.) Under Transmission nothing is selected, because we are not using the soundcard. We are sending on/off keying. You’ll see that in the plugin window when you transmit. Hi thanks for the great videos I have FSK working but trouble is when i shut the program down and turn my radio back on ,it goes into a transmission loop where i have to turn off the radio with the power button? any ideas I’ve followed everything but this is a real problem ..am i missing something? thanks again for all the great videos. Thanks for commenting here and nice to hear from you. See if RTS is checked off or activated in N1MM or MMTTY somewhere. That will do it if your radio is setup like mine. Otherwise in the radio go to Menu>Set>Connectors>USB SEND KEYING and turn off USB SEND. That may affect something else though. See if that will fix it. Hi Rich tried what you said but i think it was something to do with omni rig from another program. One other thing i found was that i was unable to send CW as well, the setting that was the problem was in the radio set section after the cw drop down box i changed the setting to ptt instead of rts always off. Now i have a fully working FSK /CW set up on the 7300 with just USB. Thanks again for all the time and effort you put into the videos they really do help! That’s great, I’m glad you got it. FSK works really well in contests. Thanks for commenting and posting your results. Best 73! Excellent article! I can transmit and receive, but it would seem that people have to go looking for me and that I am off freq when transmitting to them. Nice to hear from you and thank you for commenting. That’s a great question. I think this is what you are looking. N1MMM Logger+ MMTTY RTTY Support. Section 5.4. You’ll find that option in N1MM DI-1 RTTY window (the window where RTTY is decoded). Click on “Setup” in the Menu. See if that does it for you. Thanks for a great question. “(UPDATE 7/10/17: The EXTFSK v2.0e looks to be included with MMTTY, so there’s no need for the extra download. ” I went to their site but could not find any link to EXTFSK v2.0e. Can you please direct me to this link? Thanks for this and your great videos. Nice to hear from you and thank you for the question and thank you for the comment. The last fresh install I did of MMTTY I did not need to download the plugin EXTFSK. It appeared to be included in MMTTY installation. Install MMTTY and go to Option>Setup MMTTY>TX tab. In the dropdown scroll to the bottom and find EXTFSK64 (64bit system) to select it. I setup RTTY with Log N1MM and I used one cable USB. Nice to hear from you and that’s awesome. If you are getting FSK I’m guessing you are using VSPE. Can I ask you, did you pay for yours or are you using the free 32 bit version? If not VSPE, what are you using? 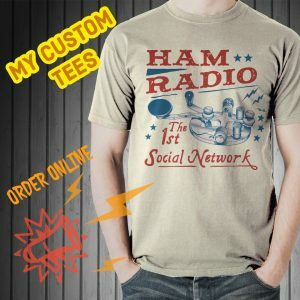 Thanks for commenting because it helps me and others know what is working for Hams. Check out my new video on N1MM and the Spectrum Display. How to make it done on IC-7410? Thanks for commenting and thanks for coming by my website. I’m sorry, but I don’t believe it will work on the 74010 like the 7300. I don’t think the 7410 can do FSK like the 7300. You would probably need to use AFSK with the 7410. Have you done that? That’s great and thank you for commenting on this post. Sometimes it’s just a matter of tweaking things a bit. 5 seconds is a long time. It may be the Silicon Labs driver for the USB cable. Did you try restarting windows and moving the USB cable to another USB port on the Laptop? Also, if you are comfortable with it, can you look in Device Manager and go to the Silicon Labs USB to UART Properties and try changing the flow control under Port Settings. Try Hardware for flow control. If that doesn’t work after a few tries, go back to the Port Settings tab and click on Advanced. Try altering the FIFO. Select a lower setting at first and try it a few times. As always, restart Windows occassionally. You could also look at the settings in MMTTY. Look at 5:10 in the video and try a different setting there. Thanks again, best 73 and let me know what happens and how it’s working. I did not see where you used the CI-V cable ? Rich, you’re the man! Thanks for your great post!